Rudolf Bultmann was a great book-reviewer. But isn’t “great reviewer” an oxymoron? Isn’t the book review the most pedestrian and most insignificant of all literary genres (at least prior to the invention of blogs)? One can perhaps write a “fair” or “useful” review – but surely not a great one! When we read Rudolf Bultmann’s reviews, however, we’re in the presence of true greatness. Engaging with new books was, for Bultmann, an important part of scholarly life. Between 1908 and 1969, he published over 250 reviews and reports on new research. And now Matthias Dreher and Klaus Müller have brought together 97 of these publications (written mainly in German, but occasionally in English) in a volume as important as it is massive. As the editors point out, in these reviews we often glimpse Bultmann “on the way to one of his own great works” (p. xi). A striking example is his 1919 review of Martin Dibelius’ new book on form criticism. Grappling with Dibelius’ methodological proposal, Bultmann remarks rather offhandedly that he hopes to do more work on this topic soon (pp. 92-94). A prescient comment, since form criticism would remain a dominant theme throughout the rest of Bultmann’s career! His reviews cross several disciplines – history of religions, Jesus and early Christianity, Paul and John, theology and church history, politics and ethics, philology and classical philosophy – but always we see Bultmann’s own gigantic intelligence at work. He is not only at the forefront of his own field, but his penetrating insight and systematic genius lead him to position and organise other fields as well. For instance, in his 1926 report on current theological scholarship (pp. 156-66), he maps the fields of theology, Old Testament, New Testament, history of religions, and church history. Reading a synthetic account like this, one must realise that Bultmann is not merely perceiving the already-existing relations between the theological disciplines, but he is himself constructing those relations in a way that would prove determinative for generations of students and scholars. Bultmann, more than anyone else except Barth, was the architect of 20th-century theology – a thinker from whom modern theology received its fundamental form and structure, its questions and horizons. 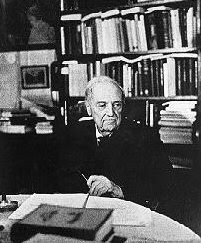 Since Bultmann was at the centre of academic theology throughout his career, there are plenty of fascinating engagements here with major figures: dialectical theologians like Barth, Brunner and Thurneysen; biblical scholars like Bousset, Dodd, Gunkel, Jeremias, Kittel, Schlatter, Schweitzer and Weiss; church historians like Harnack and Holl; as well as other major scholars like Ernst Troeltsch, Rudolf Otto, and Max Weber. Bultmann also engages with some of his own pupils. His review of Schubert Ogden’s famous Christ without Myth (1961) is especially important, since it highlights the fundamental gulf that separated Bultmann’s own theology from that of his radical “left-wing” pupils. Ogden insisted that Bultmann’s own demythologising programme was not consistent enough, and he called for a radical “dekerygmatising” of theology and a reduction of Jesus Christ to a mere “symbol” of authentic human existence. Against this proposal, Bultmann observes that the grace of God is never a philosophical “idea” but always “an act of God … in a historical event.” As such, God’s grace can only ever be “a stumbling block, a scandalon for rational thinking.” Thus Bultmann refuses Ogden’s proposal, and he observes that Ogden is in fact seeking to eliminate “the legitimate and necessary character of what the New Testament calls the stumbling block” (p. 506). General ideas and symbols are of no use; what I need is “a word which is addressed to me personally” (p. 507). As this critique of Ogden illustrates so vividly, Bultmann’s whole theology remained structured by the sheer irreducibility of the kerygma. In sum, this is a book of exceptional importance, and it is an index not only of Bultmann’s own intellectual development but also of the development of the theological disciplines in Europe throughout the first half of the 20th century. The volume provides ample proof that Bultmann was indeed a “great” reviewer – a voracious reader, a meticulous scholar, and a fiercely independent thinker. If Christian theology today must indeed take the form of Kritik, then we could do far worse than to sit – at least for a season – at the feet of Marburg’s great Kritiker.